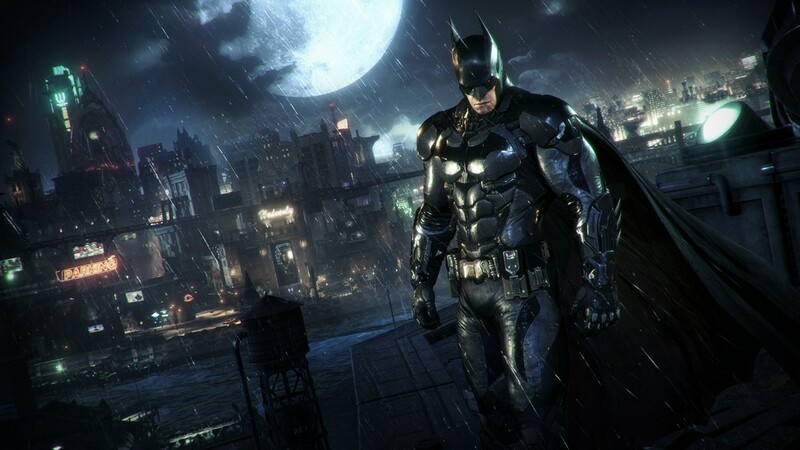 For anyone who’s been living under a rock for the past year or so, Batman: Arkham Knight is the third and final game in Rocksteady’s Batman Arkham series – a third person action game following The Caped Crusader in a new and original storyline, so original one of the main villains was specifically created for the game. As a huge fan of the world’s greatest detective, Arkham Knight has been on my radar for a long time; the previous games went against the grain of licensed products, immensely playable games with a big name on the cover (N64’s Superman game, anyone?). I’m happy to say that the game not only keeps up with, but exceeds its predecessors in terms of its story and overall quality. 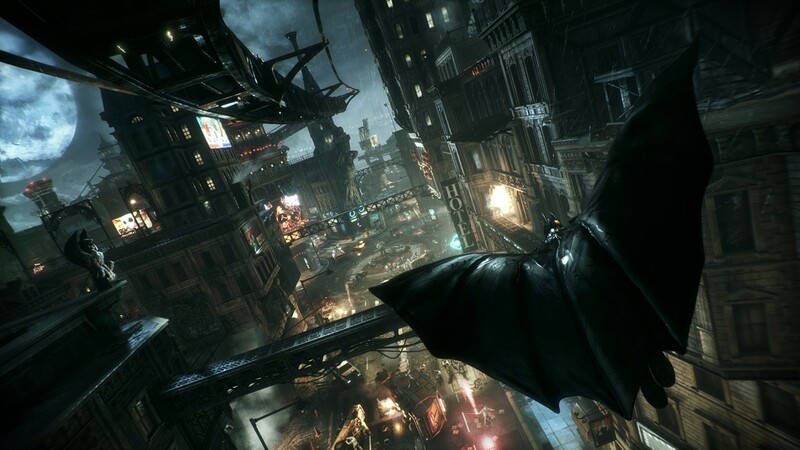 Rocksteady’s decision to make the game a next (or now current) generation-only game equates to gorgeous graphics, greater draw distances, increased numbers of on screen enemies and in-engine cut scenes, rather than the pre-rendered videos in Asylum and City. 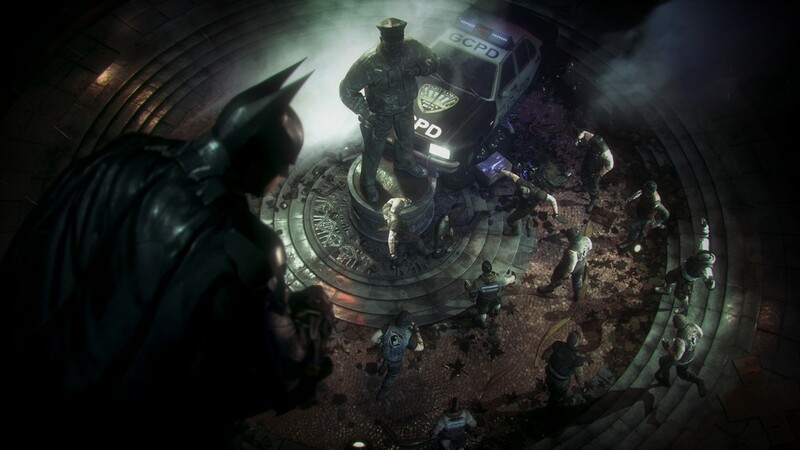 The game is set nine months after the events of Arkham City, and (spoiler alert for those who haven’t played the previous games) begins with the cremation of The Joker. 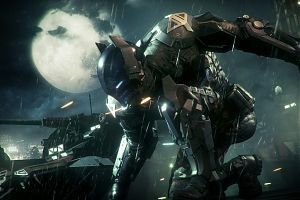 The story is led by a quality voice cast – Kevin Conroy as Batman, John Noble as The Scarecrow, Troy Baker as The Arkham Knight and the brilliant Mark Hamill as The Joker to name but a few. Conroy and Hamill’s return is noticeable; I didn’t find the WB Montreal produced Arkham Origins as enjoyable with other actors voicing The Dark Knight and The Clown Prince of Crime. With The Jester of Genocide out of the picture, Gotham City experiences a time of calm before a new storm rises in the form of The Scarecrow as the new big bad; announcing his arrival by showing off a new, more potent version of his fear toxin and threatening to drop a mother load of the stuff over the city. Cue mass evacuation of the general populous – leaving the usual type of lowly scum that thrive on chaos and anarchy to occupy the city’s streets. 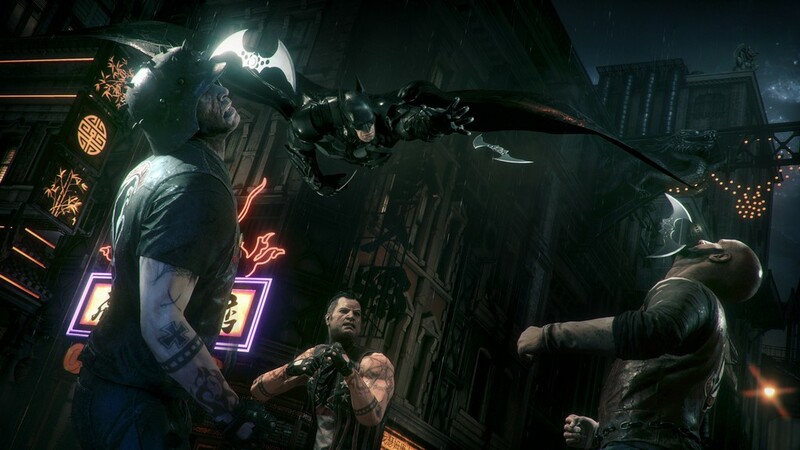 Inevitably it’s up to Batman (and his allies) to save the city in the games main story mode. 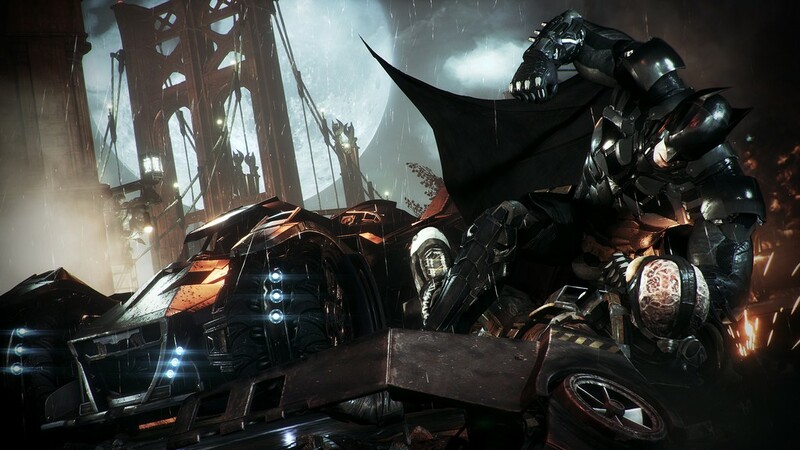 It’s not long before the eponymous Arkham Knight, a mercenary-for-hire and mysterious figure from Batman’s past, enters the fray – assisting The Scarecrow in his plot to turn Gotham into a fear fueled nightmare. 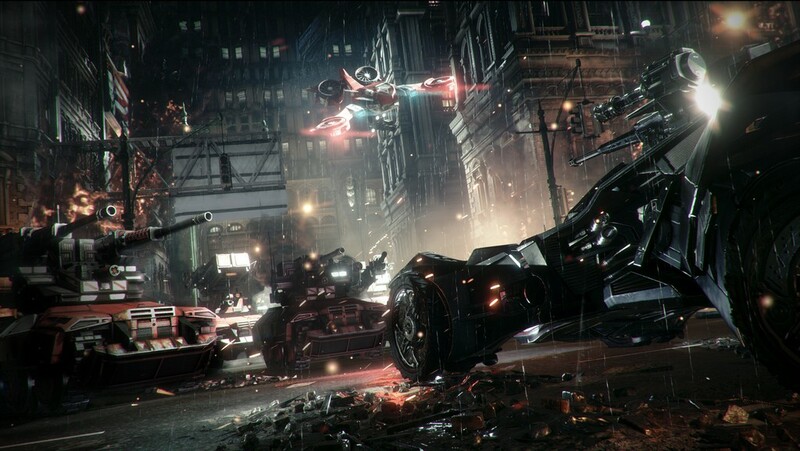 Gotham’s size has increased, with wider streets to accommodate the Batmobile and larger buildings – the city’s skyline soars much higher than ever before, which becomes more apparent later in the main story. There are also subterranean levels, such as sewer networks to navigate – set across three separate and distinct islands. One island has huge, modern glass-fronted skyscrapers, another has old gothic architecture, with gargoyles on every other building. At street level, you’ll find shop fronts, theaters and more. The level of detail is absolutely amazing. 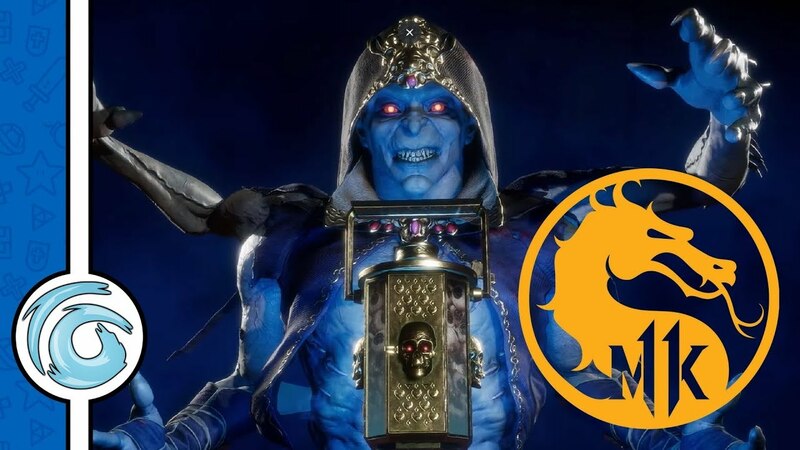 Take a while away from the missions to wander round Gotham, and you’ll come across some neat DC Easter Eggs (keep an eye on some of the gargoyles, they may remind you of someone). 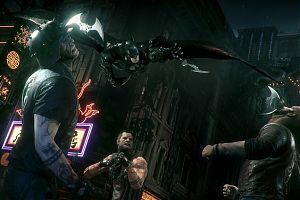 The Batman himself returns with all his gadgets from the series intact, with the option to improve them by leveling up over the course of the game – and you even aquire some new ones along the way. 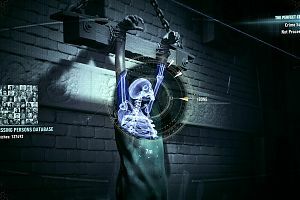 Detective mode also returns, keeping Arkham Origins’ CSI-style recreation of crime scenes – rewinding and fast forwarding to pick up the next clues at certain points of the game. Also improved is the way Batman communicates with his loyal butler Alfred and The Oracle. Instead of just holding his fingers up to his ear to visually indicate he’s speaking with them, Batman now has a holo-screen projection from his gauntlet, which looks super cool. 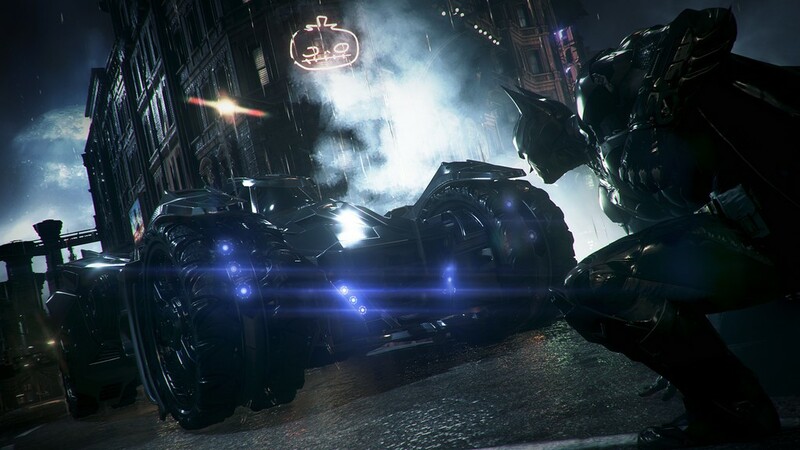 The biggest addition to this latest installment is the Batmobile, which looks like a hybrid of Tim Burton’s roadster and Christopher Nolan’s beefy tumbler. 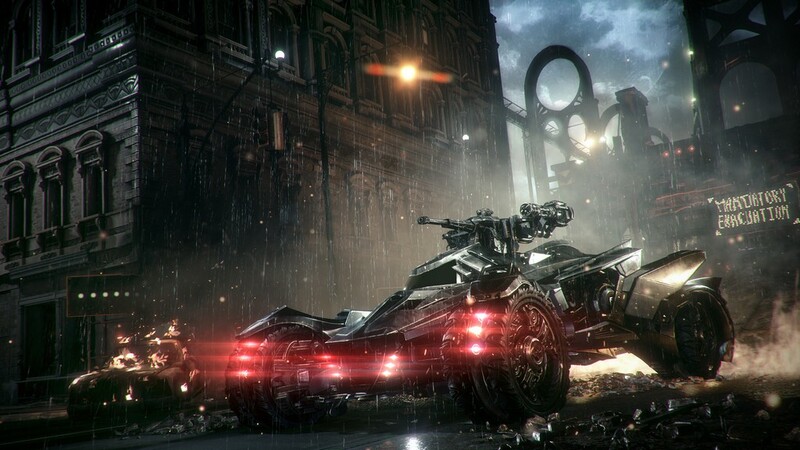 Whilst in pursuit mode, the Batmobile flies along Gotham’s crime-ridden streets; switching to battle mode, the vehicle is more tank-like, substituting steering for strafing and heavy-duty gunplay. My only initial niggle with the vehicle’s handling was Rocksteady’s decision to assign the battle mode button to L2, whilst the brake is the square button (X for Xbox One owners). This feels a tad unnatural after playing other open world games like GTA V where the brake is L2; I lost count of the amount of times I hit a building by accidentally switching to battle mode earlier in the game. Luckily the Batmobile is really rugged, and a mere wall doesn’t stop it dead in its tracks. It didn’t take long before I was drifting around corners with ease. There’s always the option of re-configuring the controls to suit the GTA layout in the pause menu’s settings if you’re really struggling with the pre-set button map. 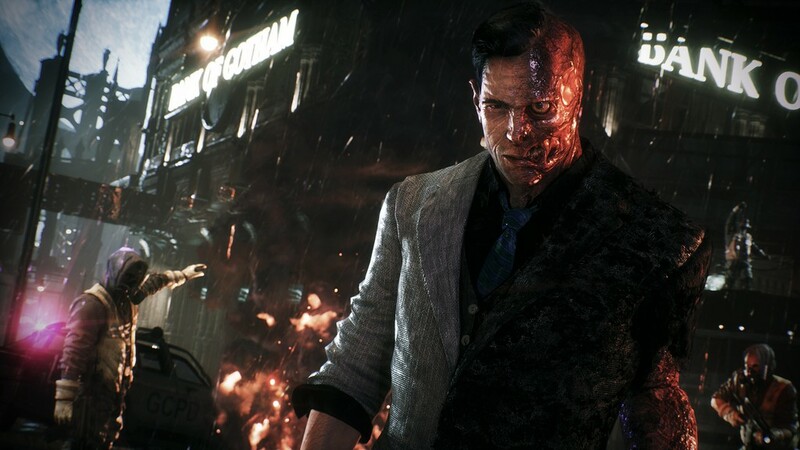 It’s obvious that Rocksteady are very proud of their new creation, as you’re encouraged to use it to further the main story and complete side missions. 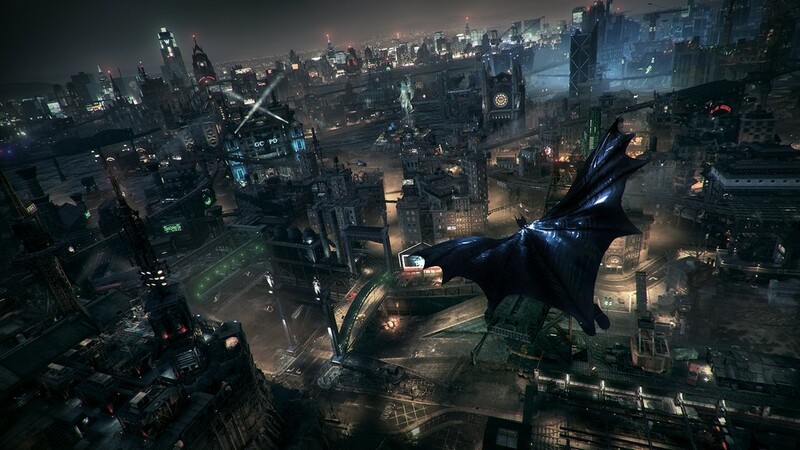 It’s also a godsend if a target location is some distance away, although if you want to grapple, swoop and glide over Gotham’s skyline, you’re free to do so. 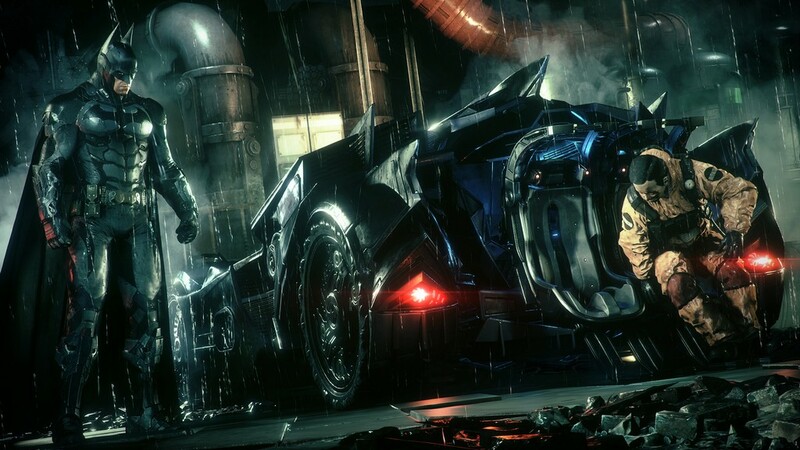 To begin with it does feel as though the car is the be all and end all of navigating Gotham’s vast map, but it’s only to get you accustomed to it – in fact there are points in the game where you simply cannot use the Batmobile to get to where you need to be. 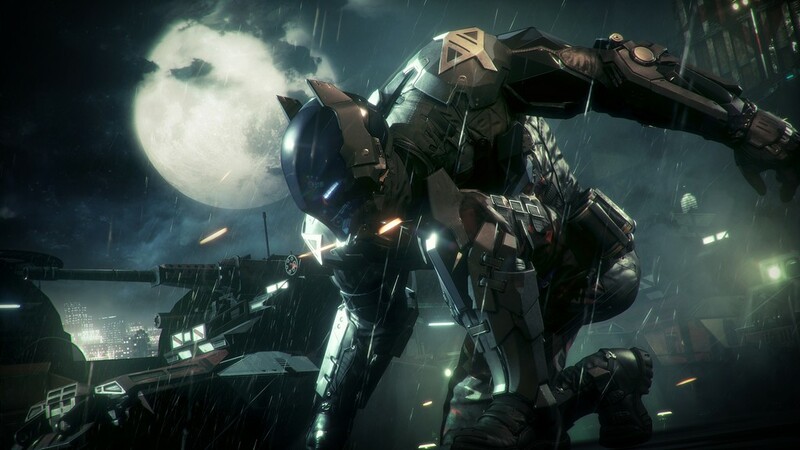 The combat system, always one of the Arkham series’ strongest points, returns with some well-thought out improvements – melee combat now has tag team-like Battle Royales as Nightwing and Robin help Batman with some of the larger fights – both in the main story and side missions. There’s also the added option of picking up a downed foe’s weapon and battering them in to submission with it (albeit for a limited time). Whilst you can just button-bash and still look like a badass, there’s nothing better than getting into a free flow rhythm whilst taking on a group of twenty or so enemies, then double-teaming one particular opponent, switching to the other hero and continuing to lay the smack down until the area is littered with broken bodies. Predator combat sequences also make a return, again with improvements in how you move around the environment. You can now swing from a vantage point to a high-level air vent, slide down to the bottom and into underground ducts, all in one fluid movement. Another great new feature is the Fear Takedown, giving you the ability to take out up to five enemies in one continuous flow – which is crucial as you’re generally facing double the number of goons than the previous games. Beware though, as the bad guys are a little savvier this time around. If you continually use a particular method to take them out, they’ll work it out (or be told) and shut that route down, forcing you out of your comfort zone and to mix it up a little. If you like to drop down from above, they’ll pop a mine under a vantage point. If you prefer to pop up from the ducts, they’ll throw a thermite charge into the network. 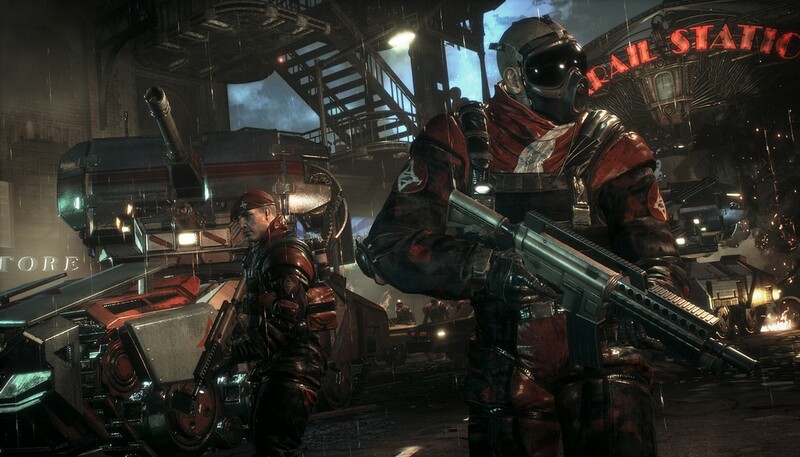 Attack too many times from the same area, and the guards will place an automated gun turret to sweep the area; some henchmen have airborne drones, to monitor higher level areas. Some groups now have medics, who revive downed comrades and can also upgrade others with electrical charges. Detective mode inhibitors are also carried by the more organised gangs, forcing you to either take down all the bad guys without using detective mode or concentrating on locating the dude with the gadget. A teeny-tiny flaw during some of the combat is a bug in the graphics– during a melee fight, a thug somehow ended up stood halfway up a raised bridge and no matter what Bat-gadgets I used, he straight up refused to return to terra ferma. During a predator sequence a downed brute’s mini-gun defied the laws of physics by continually spinning on its axis, rather than coming to rest. Once again, a minor flaw as these were the only two occurrences in roughly nine hours or so of gameplay, and to be honest they made me chuckle rather than frustrating me. 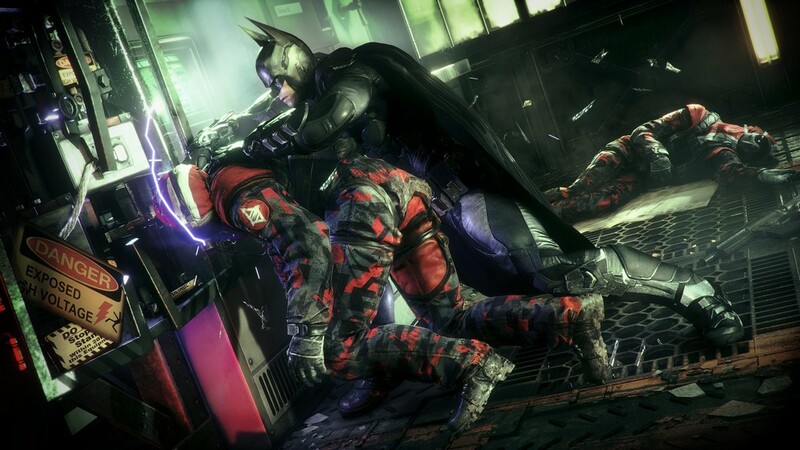 As with every other open world game (and the previous Arkham games) side missions help to bolster the main story. 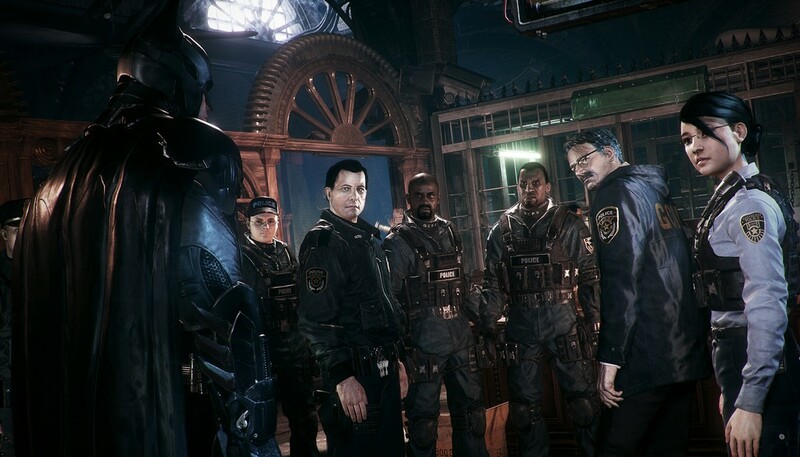 The missions in Arkham Knight help to tie Batman’s Rogues Gallery into the game – The Riddler challenges now involve a mixture of timed races in the Batmobile, with the need to alter the course to avoid collisions; and solving puzzles alongside Catwoman in order to release her from a bomb attached to a collar around her neck. The Riddler trophies also make a return, and are dotted all over the map. As with Arkham City, you’ll need to interrogate The Riddler’s cronies – handily outlined in green – to add their locations to the map. The trophies are the usual mix of sticking out like a sore thumb, thought provoking mini-puzzles and Easter Eggs for famous stories lines from the graphic novels. Collecting all the trophies in a certain area then unlocks an overall puzzle. 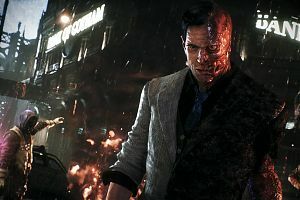 Two-Face’s missions involve taking out thugs in predator combat sequences during bank heists; with a first wave of thugs to take down – the emphasis on speed over stealth as your required to take them all out before they rob the place of every last dime in the building, then a second wave with the more traditional sneak-em-up, take your time approach. The Penguin also makes a return, using his crew to indulge in a spot of gun running. 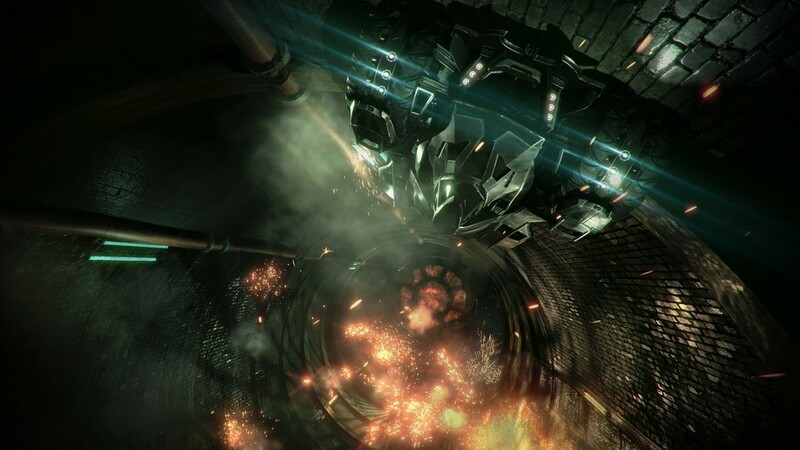 Batman’s task is to track the vehicle transporting the firearms to a holding areas and to then destroy the cache. That is of course after a spot of good, old fashioned KAPOW, BIFF, SMACK-type melee fights with the usual array of goons. There are tonnes of other missions, featuring a smorgasbord of Batman villains, both well-known and obscure; and it’s nice to see that Rocksteady thought about what characters would complement the game’s main story. 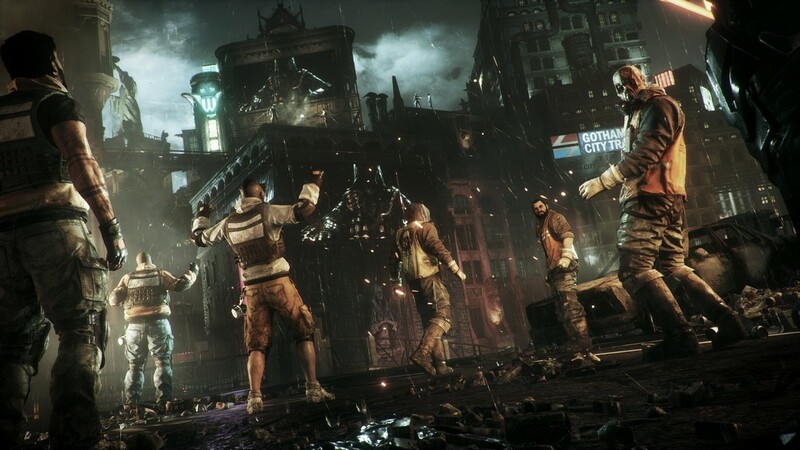 The missions are drip fed to you, as you’ll need to progress through the game and pick up intel from overheard conversations all over Gotham. 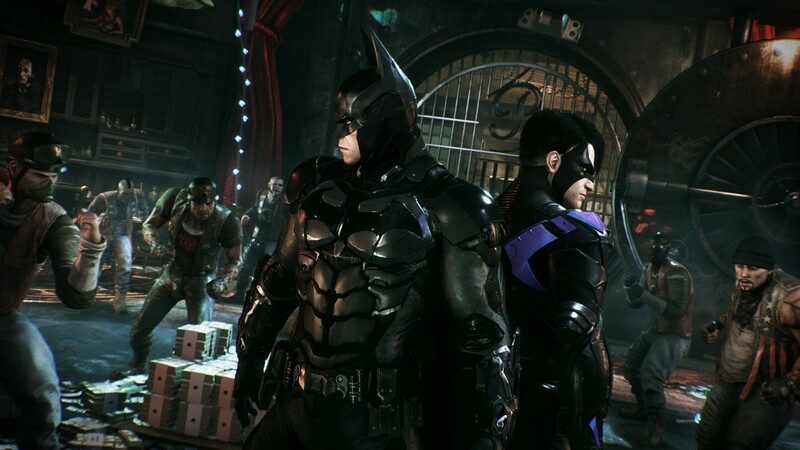 Rocksteady have cleverly disabled the record capabilities of the PS4 (and I assume the same can be said for Xbox One) at a pivotal point in the game – namely two big plot twists. I don’t want to give too much away, but I’d saw the first coming a country mile away, whilst the second was certainly unexpected. 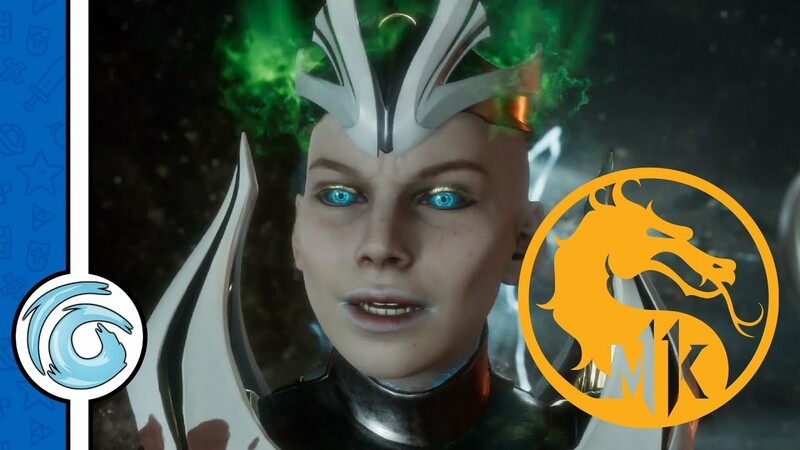 Once you’ve played to the specific part of the game you’ll understand why I’ve been intentionally vague and why Rocksteady have done this in today’s “leak everything and spoil it” culture. 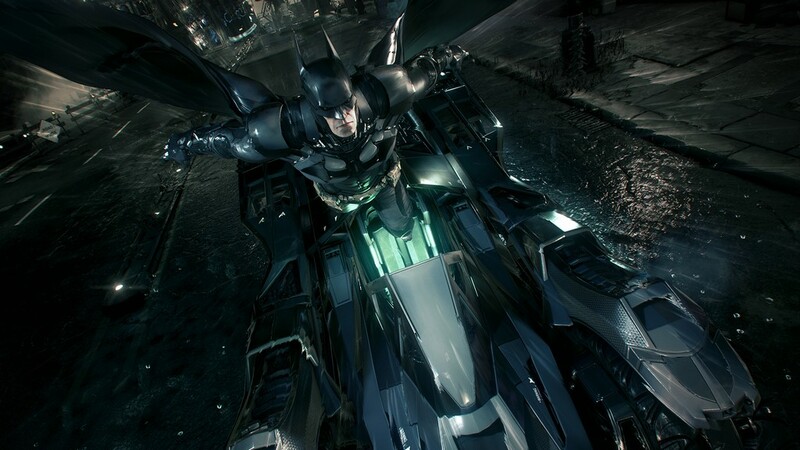 Rocksteady have prepped a whole load of DLC, from expansion packs to self-contained stories. The PlayStation special edition gets you two expansion packs (Harley Quinn and Red Hood), plus a PlayStation timed-exclusive Scarecrow nightmare pack. The Xbox One edition gets you the Harley Quinn pack, with some retailers offering the WayneTech Booster Pack. There are also character skins from classic Batman to New 52, and every version of The Dark Knight and his pals in between. Check out your relevant console’s online store, as some of the skins are available for free. 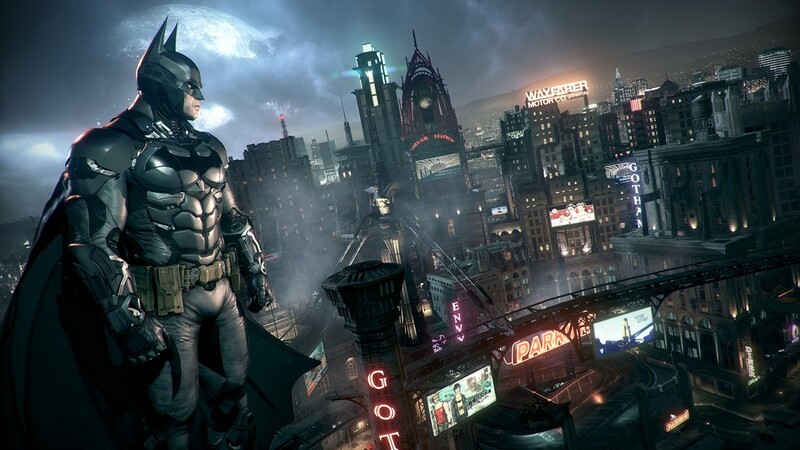 Overall, aside from a few graphical flaws, Rocksteady have once again delivered a beautifully crafted Batman game. 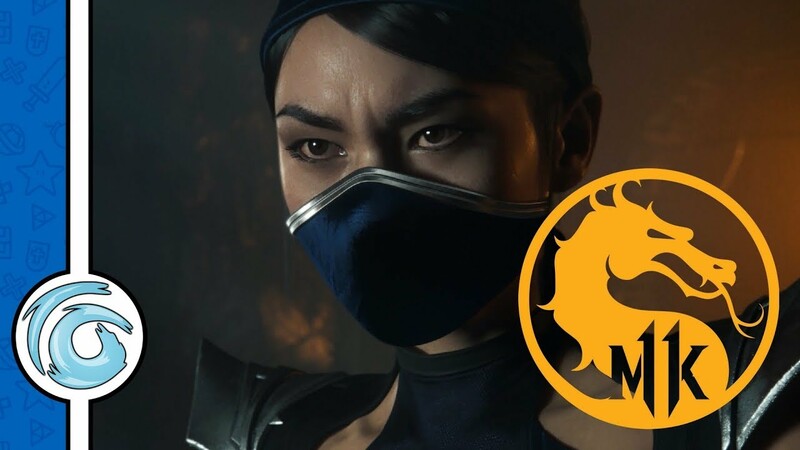 The depth of the side missions, length of the main story and all the upcoming and available DLC make the game a must-own for anyone who enjoys third-person open world games. Stunning. 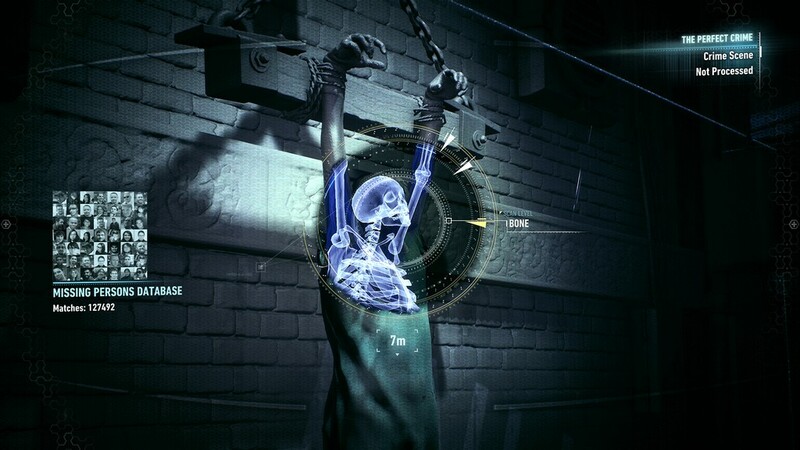 An instant classic and a fitting swan song for the Arkham Series. 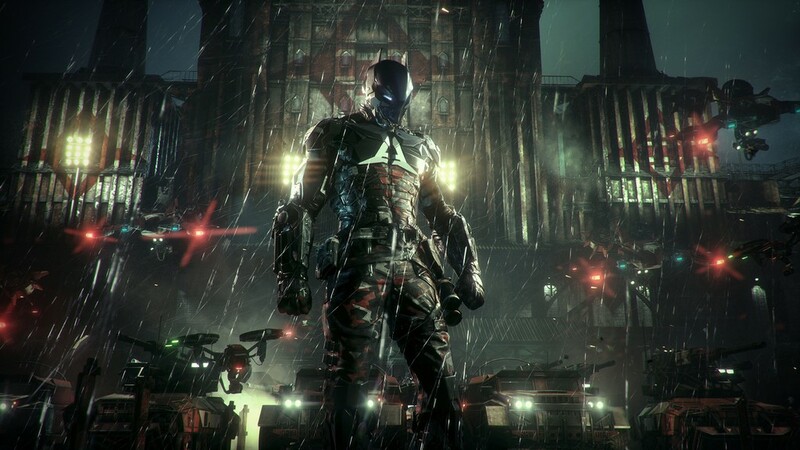 This review is based on playing the PlayStation 4 version of Batman: Arkham Knight .